By Allyn Paul, filed under Christmas Lights. 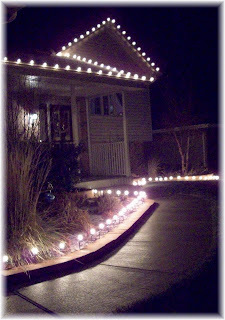 This is the final post of a 3-part series on putting up Christmas lights. You can begin by reading part 1here. Part 3 is all about the reward! 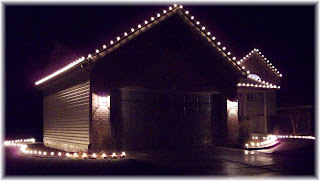 Now that you have your lights up, it is time to enjoy the clean and classy look you have achieved. At this point, you may want to add a wreath to the front door, but remember, keep the clean look…that means, no inflatable waving Santas, or plastic candy-canes littering your yard! As you can see, our Christmas Light Display is clean and classy. The spacing is perfect. Putting up Christmas lights this way is not very tough and will turn heads in your neighborhood for sure. You can buy C9 and C7 Christmas lights cheap here. Almost Time To Decorate For Christmas! Nicely done sir! It looks good Al! 3 simple words…..OBSESSIVE COMPULSIVE DISORDER!!!!!!!!!!!! Just kidding….it looks nice. I definitely agree about the blow up lawn ornaments, candy canes and all tacky decor. Hey where should i put my 5 foot tall inflatable santa? Ha Ha! Looks good, Al! It’s so funny how everyone has their opinions about these decorations. Honestly (yes Patti) I am obsessively compulive about this! Danny, you should put one on top of your crib! I agree with Samokdaddy that WALMART has alotta crap for the yard at double cheap prices. Don’t get me wrong, I do like the precise, evenly spaced lighting scheme – I AM an Engineer after all – but to use only clear lights is just isn’t very interesting. It takes a balance between clear lights (which add brightness) and colored lights (which add variety) to make a real attention getting display. I appreciate your opinions on my Christmas light display. If clean and simple is boring to you, then so be it …and thanks for taking time to comment, I really appreciate it. PS–send me some pics of your light display and we’ll post them up eh?